Bill Gates hopes to solve some of the world’s biggest problems using a new kind of philanthropy. In a passionate and, yes, funny 18 minutes, he asks us to consider two big questions and how we might answer them. (And see the Q&A on the TED Blog. 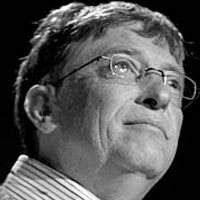 Bill Gates is founder and former CEO of Microsoft. A geek icon, tech visionary and business trailblazer, Gates’ leadership — fueled by his long-held dream that millions might realize their potential through great software — made Microsoft a personal computing powerhouse and a trendsetter in the Internet dawn. Whether you’re a suit, chef, quant, artist, media maven, nurse or gamer, you’ve probably used a Microsoft product today. In summer of 2008, Gates left his day-to-day role with Microsoft to focus on philanthropy. Holding that all lives have equal value (no matter where they’re being lived), the Bill and Melinda Gates Foundation has now donated staggering sums to HIV/AIDS programs, libraries, agriculture research and disaster relief — and offered vital guidance and creative funding to programs in global health and education. Gates believes his tech-centric strategy for giving will prove the killer app of planet Earth’s next big upgrade.